Greetings! Let's have fun and games with stencils! 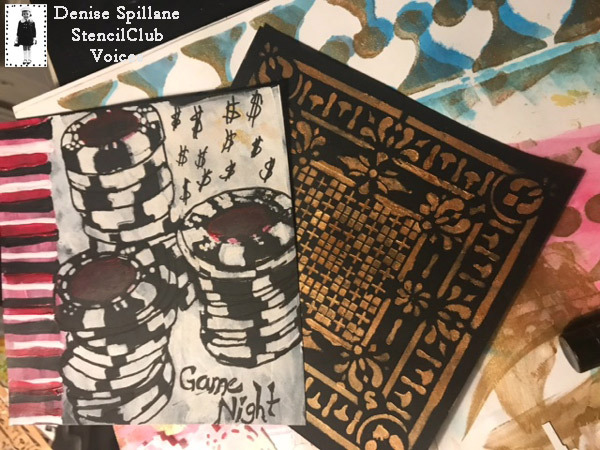 Our nifty StencilClub Voices, Wendy Featherstone, Denise Spillane, yours truly, and Josefine Fourage, indulged in fun and games with paint. 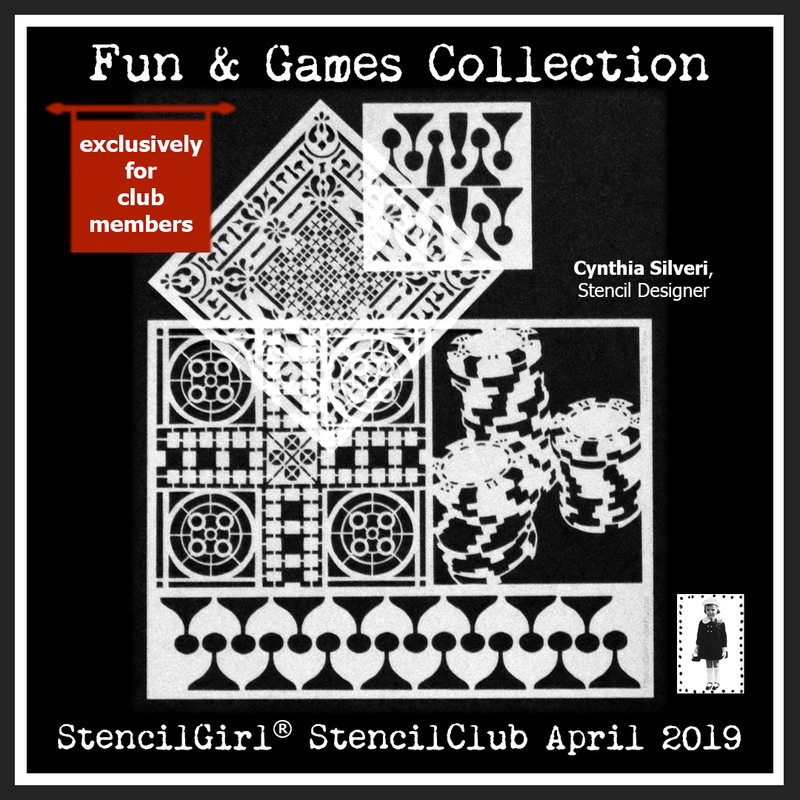 The April StencilClub set is by Cynthia Silveri. It’s so exciting to be part of StencilClub Voices, especially for this playful set. 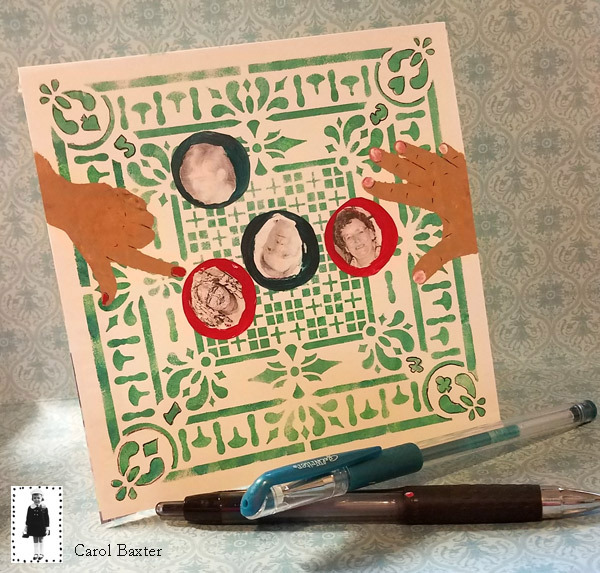 Immediately when I saw it I thought that it’s perfect for guy cards – something card makers tend to struggle with. My husband likes simple things, so I decided to keep it just that. I started by cutting my paper to 5 1/2 x 4 1/4. Then I grabbed some more “male” colors (is there such a thing?) and put some paint onto the background using a brayer. 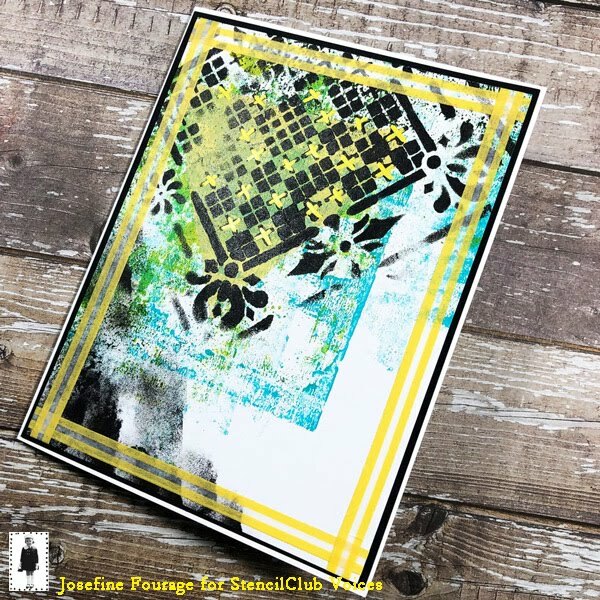 I also added a simple monoprint with the petite Gel Press set. The stencils from the April StencilClub are the focal point for these cards. For the first card, I picked the poker chips image and stenciled it using black paint and a makeup sponge. I did the same for the other two cards, focusing on one game per card. 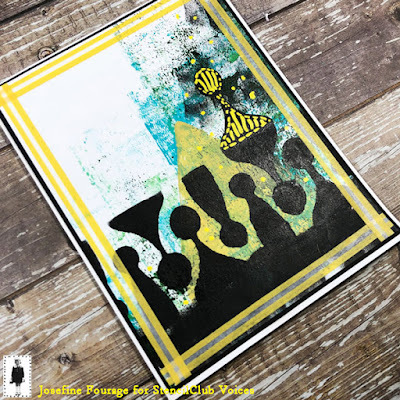 Once I was done with the stenciling part, I added a frame around it using yellow and white striped washi tape. Once I cut the pieces a little smaller and adhered them first onto black card stock and then the card base, I added a few marks all around the cards to match the washi tape and the yellow mono-prints. You see, super simple yet fun guy cards. Now you can add any sentiment, like “Happy Birthday” or “Thanks” on top and send them out. 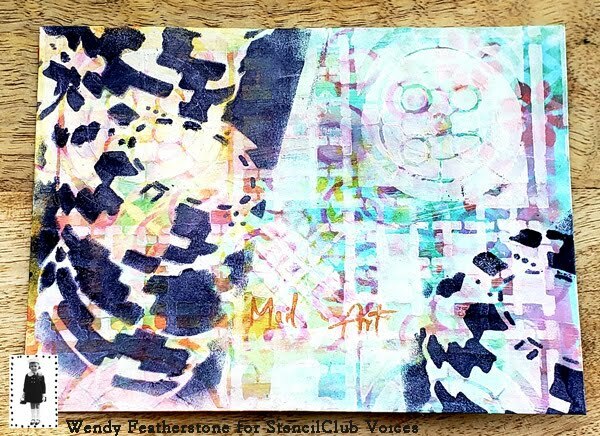 I hope you enjoyed my project for the April StencilClub Voices. 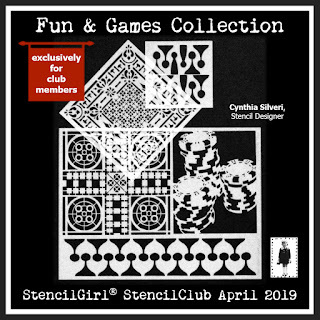 Have fun playing with your Fun & Games set by Cynthia Silveri later this month! I had way more fun creating with this new club set! 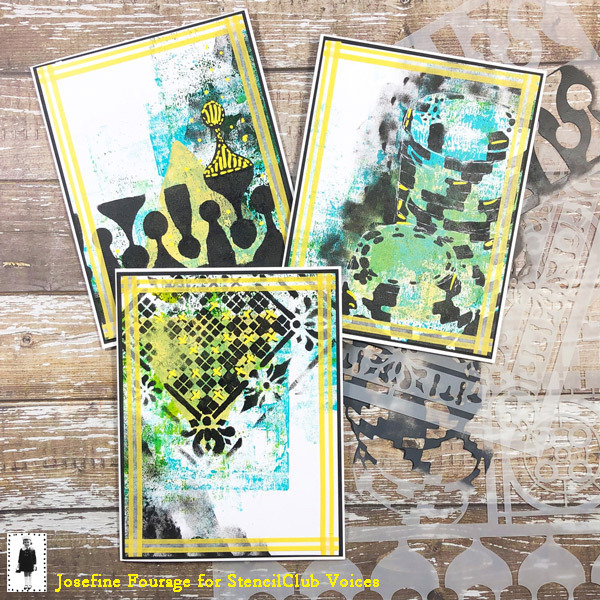 The stencils are very versatile for creating backgrounds or for pushing back color as I did with both pieces. The 6 x 6 is my fave and I will be using it a lot in my artwork. 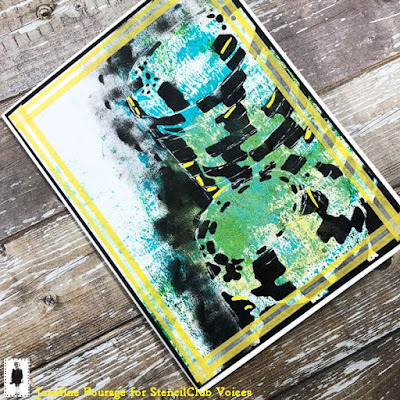 The 9 x 12 is great for adding an element of contrast, it has so many different uses and will add lots of texture and layers to your projects. 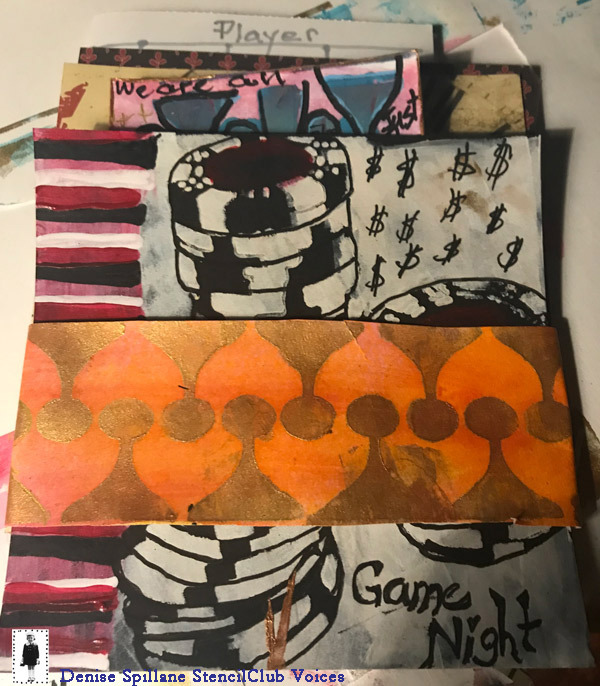 I made 4 cards in total. If you'd like to see the others, you can zip over to my Caroling with Carol blog where also I indulge in nostalgia about old snapshots and family games. Wow! 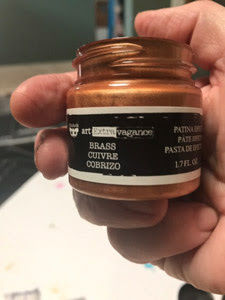 What fun these stencils are! I could not decide what to do so I am sure I will make many more things. I decided to use them to make a game themed mini book which will be wrapped vs. bound. 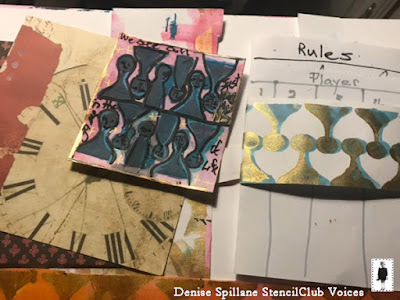 I layered some of the stencils, drew, doodled and wrote. I found my hands don’t work as well as they used to but that doesn’t stop me. 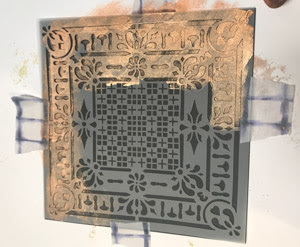 First I stenciled the 6x6 game with a bronze paste. Next, I did more stenciling of borders and small stencil. 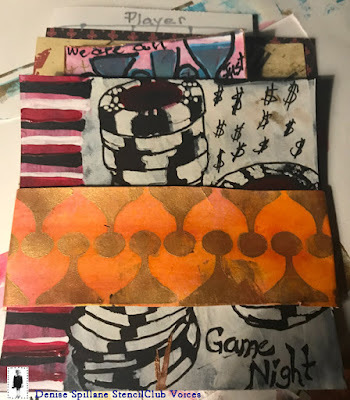 I made rules and players pages with a band, (the gold, blue and white). Then I added more stenciled pages as covers and some scrap paper for doodles or whatever. And finally the covers (orange and gold) band for the whole book. 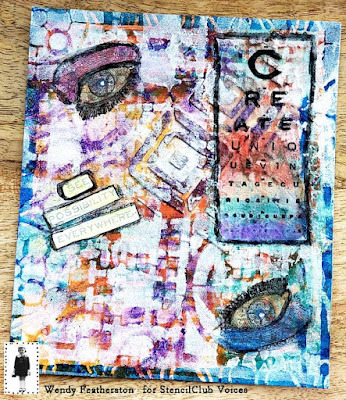 It is a little like a junk journal. C'mon! 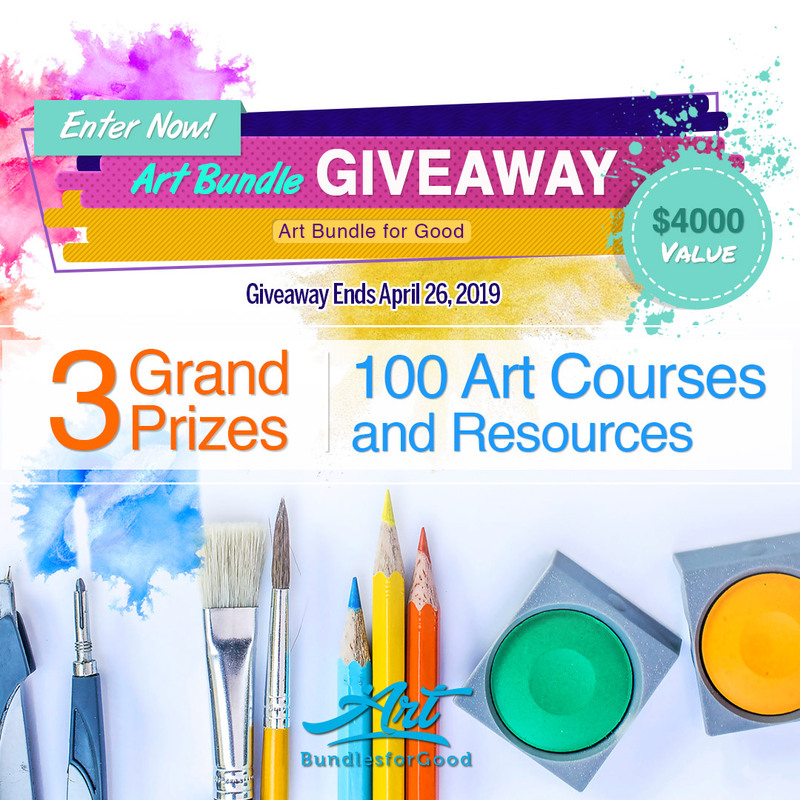 You know you want to be a part of Fun & Games! Check out what Cynthia had to say about her set and exclusive club member project.